A quick roundup of this months events, which includes our trip to Decorex International, hosting a coffee morning at our London & Bromham bespoke kitchen furniture showrooms in aid of Macmillian Cancer Support and a thank you to The Royal Marsden for letting us be a part of their hugely successful fund-raising event by featuring us in their Charity event programme. 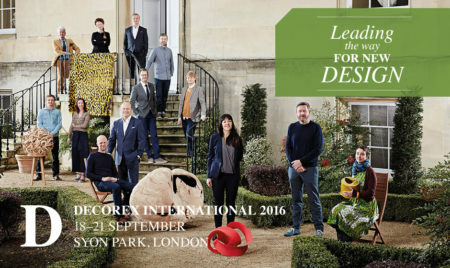 Decorex International returned once again this year, for the 39th year running, showcasing a selection of the very best in suppliers to the trade, both leading names and emerging talent. We visited the Sion Park exhibition to get the low-down on what is hot this year in the world of high-end design and we were amazed by the truly inspiring array of exhibitors, all embracing this year’s theme of ‘Roots of Design’. Our highlights from this years show included attending a seminar on the ‘future of retailing’, an insightful look at where the experts believe luxury design-led retailing is headed. The opinion of the panel, was that we will move towards ‘experience based’ shopping; moving away from traditional shopping environments in favour of more realistic ‘home-like’ set-ups. They believe that this new concept of shopping will allow consumers to actively experience products and shoppers will be encouraged to participate in their surroundings. An example of this concept can be seen at the Ilse Crawford ‘Ett Hem’ Hotel – here, guests can turn on the television in the sitting room, borrow the car or take the dog for a walk. They can make themselves at home, help themselves from the fridge. We at McCarron & Co already recognise the importance of this experienced based shopping, and our working displays allow us to let clients visualise themselves at home and shop in a relaxed, pressure free environment. The ability to be able to demonstrate working appliances in a home-like setting means that clients can enjoy a lifestyle led shopping experience, helping them make the right decisions when it comes to bespoke kitchen furniture design – one of the most crucial elements when planning a home renovation. Other highlights from the show included the Lapicida stand, where an exquisite new collection launched in collaboration with jewellery designer Lara Bohinc. 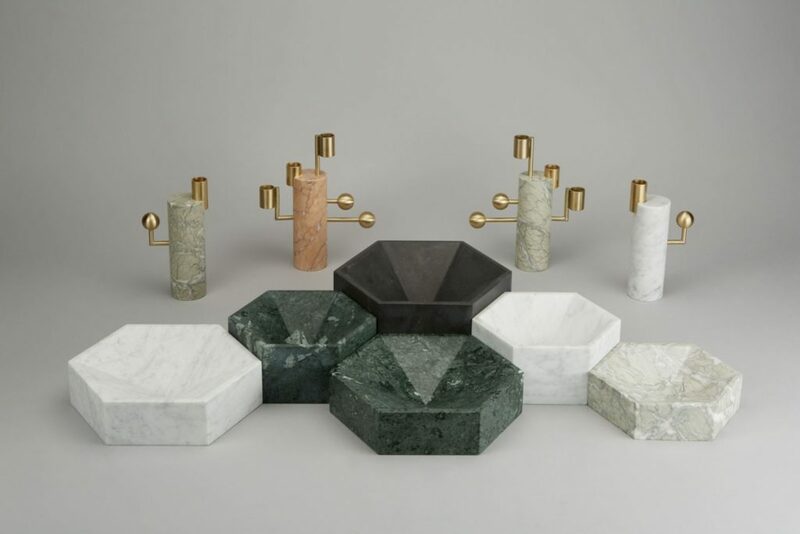 The ‘Lunar’ collection features a sophisticated range of sculptural accessories combining brass and marble, highlighting Lapicida’s exceptional use of materials and craftsmanship. To show our support of the Macmillan Cancer charity, we decided to put our baking skills to the test this September and become part of this years ‘World’s biggest Coffee Morning’. 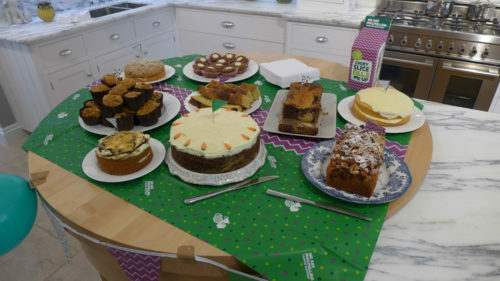 From our bespoke kitchen furniture London showrooms, to the team at the head office and Wiltshire workshops, our entire team were involved, which helped to make the day a huge success both in money raised and number of cakes consumed! We even got to make use of our Wolf duel fuel range cooker in the Notting Hill showroom which was a great way to put to the test this top of the range appliance and judging by the results of the delicious scones that were produced, we can say first hand that it really is a dream to cook in – the larger than average ovens meant that we were not short on space, and the scones were certainly some of the best we have tasted. 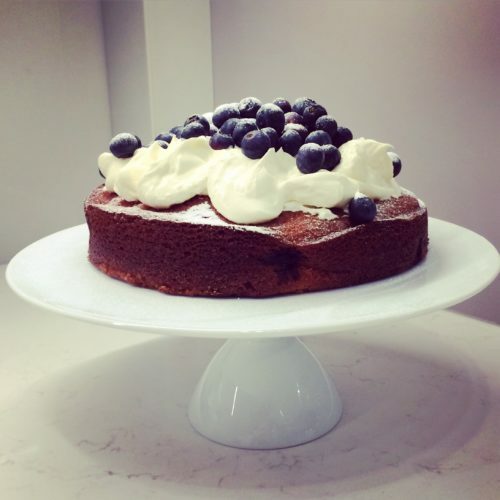 One of the favorite recipes from the day, was a delicious blueberry cake which was adapted from the ‘Hummingbird Bakery’ cookbook. In the original version, they suggest topping with a cream cheese frosting (if you want the original recipe the link is here: http://www.goodtoknow.co.uk/recipes/475414/The-Hummingbird-Bakery-blueberry-cake) but we tweaked the recipe and used a fresh cream topping instead and we baked the cake in a 20” tin, rather than the ring mould as per the original. For the slightly ‘tweaked’ version, the recipe is below. Put the butter and sugar in a freestanding electric mixer with a paddle attachment (or use a handheld electric whisk) and cream until light and fluffy. Add the eggs one at a time, mixing well and scraping any unmixed ingredients from the side of the bowl with a rubber spatula after each addition. Beat in the vanilla extract, flour and baking powder until well mixed. Add the soured cream and mix well until everything is combined and the mixture is light and fluffy. Gently stir in the blueberries by hand until evenly dispersed. Pour the mixture into the prepared cake tin and smooth over with a palette knife. Bake in the preheated oven for 40 minutes, or until golden brown and the sponge bounces back when touched. Leave the cake to cool slightly in the mould before turning out onto a wire cooling rack to cool completely. When the cake is cold, put it on a serving plate, cover the top and sides with the cream frosting and decorate with more blueberries. Dust with a light sprinkling of icing sugar. Add the icing sugar and vanilla gradually while beating. Whip until light and a thick enough consistency to spread as an icing and use immediately. Finish by adding the remaining blueberries to the top of the cake and lightly dust the cake with a sprinkle of icing sugar. McCarron & Co were honoured to support the Royal Marsden Cancer Charity this September, by appearing in the ‘Memories of Flanders & Swann and Cabaret Time’ programme. This wonderful charity event was a huge success and they managed to raise over £13,000. The funds raised will go towards ensuring that the Royal Marsden continues to be at the forefront of cancer research and pioneering new treatments which continue to save lives. To keep up to date with all the latest news from McCarron and Co including news of our bespoke kitchen furniture and regular industry updates, follow us on Instagram, Houzz, Pinterest, LinkedIn and Facebook.